Hemel Hempstead Town confirmed their position as serious National League South playoff contenders with a comfortable 3-1 win over Oxford City at Vauxhall Road. A quiet first half burst into life when the Tudors scored twice in a couple of minutes just before the break. First, Morgan Ferrier raced onto an excellent through-ball from Ricky Wellard, tucking the ball past former Hemel keeper Laurie Walker. the ball home to make it 2-0. Before the late drama, neither side had created much, though Michael Richens had two excellent chances around the half hour mark. The first was when he met a free-kick with his head but put it wide, and minutes later he found space at the far post but his first time shot also flew past the post with the goal gaping. The home side were hampered somewhat when Daniel Pappoe had to be replaced by Ollie Thorne when he suffered a shoulder injury after just 26 minutes, then Thorne himself also suffered an injury and had to go off. 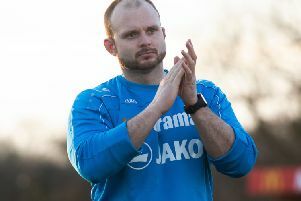 The second period saw City push forward more and keeper Jamie Butler had to be alert when Matt Whichelowe beat the offside trap but not the keeper who saved well. With Oxford pressing, Hemel looked dangerous on the break and they were awarded a penalty when Kyle Connolly broke down the left and drove into the box, before unleashing a shot that struck a defender’s arm. The referee had no hesitation in pointing to the spot. Ben Herd saw his penalty well saved by Walker, but the ball wasn’t cleared and it broke to Michael Richens who hammered home to make it 3-0. The home side eased up somewhat and allowed Oxford back into the game and on 68 minutes Lee Henderson headed home a corner to reduce the deficit. City huffed and puffed but apart from a late save by Butler, they rarely threatened and the Tudors held on to take the points and keep their playoff hopes alive. Results elsewhere mean that Hemel move up to fourth place in the table, and could confirm their place in the playoffs when they travel to Margate next week. Hemel 1: Jamie Butler 2:Ben Herd 3: Kyle Connolly © 4:Daniel Pappoe (14: Oliver Thorne - 16: Matt Spring) 5: Matt Mitchell-King 6:Adam Bailey-Dennis 7:Ricky Wellard 8:Michael Richens 9:Ibra Sekajja (12: Harry Hickford) 10:Morgan Ferrier 11: Graeme Montgomery. Subs not used 15: Jack Kelly 17: Reiss Greenidge. Oxford City 1: Laurie Walker 2:Jon Arzemendi 3:Jose Lapoujade © 4:Reece Fleet (15:Matt Peake-Pijen 5:Lee Hnederson 6:Adrian Santiago 7:Carlos Pifarre-Forner (14: Declan Bejamin) 8: Julen Lafuente 9:Bradley Bubb 10:Matt Whichelowe (14:Connor McDonagh) 11:Kynan Issac. Subs not used 16:Amer Awadh 17:Tyriq Hunte.